Rabbit is the common name for small mammals in the family Leporidae of the order Lagomorpha, characterized by long ears and legs, large hind feet, a short and bushy tail, and young born without fur and with closed eyes. All other members of Leporidae are placed in the Lepus genus and are known as hares, characterized by longer ears, generally larger size and faster running speed, and young born with fur and with open eyes (Angerbjörn 2004). The term, "rabbit" sometimes is used as a collective term for all members of the Leporidae family, including the hares, and sometimes for all members of the Lagomorpha order, a group that also includes the pikas, which are placed in family Ochotonidae. Some true hares (genus Lepus) also have the name rabbit (jackrabbits). This article will encompass all members of Leporidae family placed in genera other than Lepus. Rabbits are an important component of their native ecosystems in which their high reproductive rate makes them integral to terrestrial food chains, as they consume plant matter and provide food for such animals as foxes, raptors, cats, ferrets, and raccoons. Where humans have introduced rabbits into ecosystems like those of Australia in which there are few controlling predators, however, rabbits have proliferated excessively and caused environmental problems, including habitat degradation, loss of unique native flora and fauna, and agricultural damage. Humans in many parts of the world have used rabbits as a source of food and fur, hunted them for sport, used them in laboratory research, and raised them as pets. Rabbits add to the human enjoyment of nature and are a feature in culture, whether in books and paintings, or as symbols, such as for fertility or rebirth. Rabbits, hares, and pikas comprise the order Lagomorpha, which is divided into two families: Leporidae (hares and rabbits) and Ochotonidae (pikas). Originally classified as rodents (order Rodentia), the lagomorphs are separated based on having a second, small, peg-like upper incisor sitting behind the first, large, continually growing incisor, whereas rodents possess only a single, upper incisor (Smith 2004). Also, lagomorphs have a single layer of enamel in the front incisors versus the double layer in rodents (Smith 2004). Lagomorphs have relatively large to huge ears, short tails (not visible in pikas), and cannot grasp food with their paws (Smith 2004). Lagomorphs have a very large digestive system, apparently adapted to digesting large amounts of plant material whose nutrient content is difficult to extract (Smith 2004). The caecum tends to be giant—up to ten times larger than the stomach—and it has a rich fauna of bacteria and other microorganisms that help to break down the plant matter (Smith 2004). Lagomorphs also practice coprophagy, whereby they eat their feces to undergo re-digestion, which helps yield up to five times as many vitamins as in the original food (Smith 2004). The Leporidae family comprises 11 extant genera and 61 species of hares and rabbits (Angerbjörn 2004) with one genus, Lepus, comprising all the true hares, while rabbits are classified into the other 10 genera. Leporids tend to have brown or gray as the base of the soft fur, although some forms turn white for winter, and two species are striped (Angerbjörn 2004). There also is the black Amami rabbit, Pentalagus furnessi, of Japan. Leporids all have long legs, long ears, and large hind feet, as well as a short and bushy tail. Each foot has five digits (one reduced); rabbits and hares move about on the tips of the digits in a fashion known as digitigrade locomotion. Full-bodied and egg-shaped, wild rabbits are rather uniform in body proportions and stance. Rabbits tend to range in size from 25 to 50 centimeters (cm) in length (10 to 20 inches), and weigh from 400 to 3,000 grams (14 ounces to 6.6 pounds) (Angerbjörn 2004). Hares tend to be larger in size, ranging up to 6,000 grams (13.2 pounds) and 75 centimeters (30 inches) (Angerbjörn 2004). Hares tend to have longer legs and ears (often with black markings on the fur of their ears) and tend to be faster. The smallest rabbit is the pygmy rabbit, Brachylagus idahoensis, at only 20 cm in length and 0.4 kg (0.9 pound) in weight. Rabbits are clearly distinguished from hares in that rabbits are altricial, having young that are born blind and hairless. In contrast, hares are generally born with hair and are able to see (precocial). Rabbits are often known affectionately by the pet name "bunny" or "bunny rabbit," especially when referring to young, domesticated rabbits. Originally, the word for an adult rabbit was "coney" or "cony," while "rabbit" referred to the young animals. More recently, the term "kit" or "kitten" has been used to refer to a young rabbit. A group of young rabbits is referred to as a "kindle." Young hares are called "leverets," and this term is sometimes informally applied to any young rabbit. Male adult rabbits are called "bucks" and female adult rabbits are known as "does." A group of rabbits or hares is often called a "fluffle" in parts of Northern Canada. A group of rabbits is called a "herd." Rabbits are ground dwellers that live in environments ranging from desert to tropical forest and wetland. Most rabbits are found in forest and shrubs and live underground in burrows or warrens (interconnected maze of burrows); hares are more common to open areas and live in simple nests above the ground. Some rabbits do not build burrows, but live in dense cover or hollows underground. The eastern cottontail, Sylvilagus floridanus, nests in holes, where the young are raised (Angerbjörn 2004). Rabbits are found in most areas of the world. The natural geographic range of rabbits encompasses the middle latitudes of the Western Hemisphere, and in the Eastern Hemisphere, rabbits are found in Europe, portions of Central and Southern Africa, the Indian subcontinent, Sumatra, and Japan. The European rabbit (Oryctolagus cuniculus) has been introduced to many locations around the world, and all breeds of domestic rabbit originate from the European. Most rabbits live solitary lives and are non-territorial, although the European rabbit is "extremely social," living in a warren (a maze of burrows connected together) with 6 to 12 adults and controlled by a dominant male at the top of a linear dominance hierarchy (Smith 2004). Rabbits tend to stay in the vicinity of safe hiding places in home ranges or territories and to escape predation by running into burrows and holes (Angerbjörn 2004). Hares, on the other hand, may travel considerable distances and have large home ranges, and tend to escape predators by running away (Angerbjörn 2004). Many species of rabbits and hares have distress calls or thump their hind feet to warm of predators (Angerbjörn 2004). The large, laterally set eyes of rabbits provide a nearly circular field of vision, which allows them to detect motion and avoid predators (Smith 2004). Rabbits have a keen ability to detect odors and communicate largely through the sense of smell (Smith 2004). Utilizing glands on their cheeks, groin, or chin, they rub pheromones on their fur during grooming and deposit scent marks on rocks or shrubs, or use urine or feces to leave scent markings (Smith 2004). Such odors advertise their reproductive status or mark territories (Smith 2004). Rabbits are strictly herbivores that feed by grazing on plants such as grasses, clover, and dandelions, and parts such as leaves, twigs, buds, bark of young trees, roots, and seeds (Angerbjörn 2004). Their diet contains large amounts of cellulose, which is hard to digest. Rabbits solve this problem by coprophagia—ingesting their own droppings (feces), as is common with all lagomorphs. Rabbits are hindgut digesters. This means that most of their digestion takes place in their large intestine and caecum. A soft feces is excreted from the caecum and reingested and then digested in the stomach and small intestine (Smith 2004). They also produce hard round dry pellets, separated in the digestive system by a mechanical separation, and generally consisting of poorer quality particles; these hard pellets are passed quickly (Smith 2004). While literature often states that hard pellets are not eaten, research has shown that lagomorphs also regularly eat hard feces (Smith 2004). Basically, leporids tend to feed on fresh food during the evening and night and excrete the hard and soft feces during the day and reingest them (Smith 2004). Males and females are promiscuous, not forming lasting pair-bonds, but rather mating with different individuals. Females of the European rabbit (Oryctolagus cuniculus)—and presumably other rabbits—are reflex (or induced) ovulators that require the act of copulation to stimulate ovulation, which occurs about 12 hours after mating (Smith 2004). Most rabbits produce many offspring each year, although scarcity of resources may cause this potential to be suppressed. A combination of factors allows the high rates of reproduction commonly associated with rabbits. Rabbits generally are able to breed at a young age, and many regularly conceive litters of up to seven young, often doing so four or five times a year due to the fact that a rabbit's gestation period is only about 30 days (Smith 2004). They may mate again soon after giving birth. (Some hares actually mate and are impregnated again prior to giving birth.) As an example, the eastern cottontail, Sylvilagus floridanus, normally has three to five litters per year, but can have up to seven, and the mean litter size is typically two to six individuals, with fifty percent of the juveniles breeding their first year (Angerbjörn 2004). Newborn rabbits are naked, blind, and helpless at birth (altricial). While the European rabbit is social, for most other rabbits the young do not receive much parental care (Smith 2004). While mothers typically make a nest, sometimes lined with fur from their own belly and plant material, they may nurse their young only one time a day, for a few minutes, although the milk is highly nutritious (Smith 2004). This rare attention to the young may be an adaptation to reduce the likelihood of predators finding the juveniles (Angerbjörn 2004). Angerbjörn (2004) reports that there are 29 extant species of rabbits in 10 genera: Oryctolagus (1 species, the European rabbit), Sylvilagus (17 species, cottantails), Brachylagus (1 species, pygmy rabbit), Bunolagus (1 species, riverine rabbit), Pentalagus (1 species, Amami rabbit), Pronolagus (3 species, red rock-hares), Caprolagus (1 species, hispid hare), Poelagus (1 species, Bunyoro rabbit), Nesolagas (2 species, striped rabbits), and Romerolagus (1 species, volcano rabbit). Rabbit breeds are notably different varieties of domestic rabbit created through selective breeding or natural selection both as pets and as a meat source. Breeds recognized by organizations such as the American Rabbit Breeders' Association (ARBA) may be exhibited and judged in rabbit shows. Breeders attempt to emulate the breed standard by which each breed is judged. The ARBA lists more than 40 different rabbit breeds. They range in size from the 3 pound Dwarf Hotot to the giant German Grey rabbit, which has attained a record weight of 23 pounds and has been imported into North Korea as a new food animal. Colors range from white to brown, grey, and black, with a variety of spotting patterns. The "lop" varieties are notable for their long floppy ears. Rabbits are an important component of many ecosystems. They also provide humans with economic, nutritional, and recreational benefits and as well play a part in the aesthetic dimensions of diverse cultures. Rabbits are integral to food chains, as they consume vegetative materials and in turn are eaten by predators, including foxes, raptors (such as eagles), lynxes and other cats, ferrets, and raccoons. Rabbits are a favorite food item of large pythons, such as Burmese pythons and reticulated pythons, both in the wild, as well as pet pythons. Rabbits are a meat source for humans in Europe, South America, North America, some parts of the Middle East, and China, among other places. Rabbit is still commonly sold in United Kingdom markets, although not frequently in supermarkets. At farmers markets and the famous Borough Market in London, rabbits will be displayed dead and hanging unbutchered in the traditional style next to braces of pheasant and other small game. 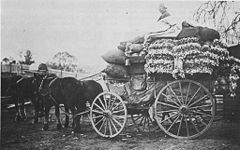 Rabbit meat was once commonly sold in Sydney, Australia, but quickly became unpopular after the disease myxomatosis was introduced in an attempt to wipe out the feral rabbit population. When used for food, rabbits are both hunted and bred for meat. Snares or guns, along with dogs, are usually employed when catching wild rabbits for food. In many regions, rabbits are also bred for meat, a practice called cuniculture. Rabbits can then be killed by hitting the back of their heads, a practice from which the term rabbit punch is derived. Rabbit meat is a source of high quality protein. It can be used in most ways chicken meat is used. Rabbit meat is leaner than beef, pork, and chicken meat. Rabbit products are generally labeled in three ways, the first being fryer. This is a young rabbit between 1½ and 3½ pounds and up to 12 weeks in age. This type of meat is tender and fine grained. The next product is a roaster; they are usually over 4 pounds and over 8 months in age. The flesh is firm and coarse grained and less tender than a fryer. Then there are giblets, which include the liver and heart. One of the most common types of rabbit to be bred for meat is New Zealand white rabbit. There are several health issues associated with the use of rabbits for meat, one of which is tularemia or rabbit fever. Caused by a bacteria, Francisella tularensis, tularemia can affect both animals and humans and can be contracted by eating rabbit meat that is not cooked well, among other means (UTDH 2001). Another illness is called rabbit starvation, and it is the form of acute malnutrition caused by excess consumption of any lean meat (specifically rabbit) coupled with a lack of other sources of nutrients. It is due most likely to essential amino acid deficiencies in rabbit meat and synthesis limitations in human beings. Another economic value of rabbits is as a source of fur, such as the pelt of the cottontail rabbit (genus Sylvilagus) sometimes being used for clothing and accessories, such as scarves or hats. Rabbits are very good producers of manure; additionally, their urine, being high in nitrogen, makes lemon trees very productive. Rabbits also are a source of hunting for sport, with cottontail rabbit particularly popular in North America. A rabbit sharing an apple with his owner. 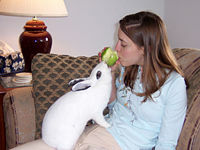 Rabbits also are kept as pets. They typically are kept in hutches—small, wooden, house-like boxes—that protect the rabbits from the environment and predators. Rabbits kept in a home as pets for companionship are referred to as house rabbits. They typically have an indoor pen and a rabbit-safe place to run and exercise, such as a living or family room. Rabbits can be trained to use a litter box and can learn to respond when called. Their diet typically consists of unlimited timothy hay, a small amount of pellets, and fresh vegetables. House rabbits are quiet pets, but are unsuitable for households with small children as they are easily frightened by loud noises and can be harmed by mishandling. Domestic rabbits that are not house rabbits also often serve as companions for their owners, typically living in an easily accessible hutch outside the home. Rabbits as pets can find their companionship with a variety of creatures, including humans, other rabbits, guinea pigs, and sometimes even cats and dogs. It was commonly believed that pregnancy tests were based on the idea that a rabbit would die if injected with a pregnant woman's urine. This is not true. However, in the 1920s, it was discovered that if the urine contained the hCG, a hormone found in the bodies of pregnant women, the rabbit would display ovarian changes. The rabbit would then be killed to have its ovaries inspected, but the death of the rabbit was not the indicator of the results. Later revisions of the test allowed technicians to inspect the ovaries without killing the animal. A similar test involved injecting Xenopus frogs to make them lay eggs, but animal assays for pregnancy have been made obsolete by faster, cheaper, and simpler modern methods. Rabbits can provide an aesthetic joy in the wild. They also have been used as objects for paintings, novels, and other art works, and have symbolic value in culture as well. Rabbits are often used as a symbol of fertility or rebirth, and have long been associated with spring and Easter as the Easter Bunny. Rabbits are often used as symbols of playful sexuality, which also relates to the human perception of innocence, as well as its reputation as a prolific breeder. The rabbit often appears in folklore as the trickster archetype, as he uses his cunning to outwit his enemies. In Chinese literature, rabbits accompany Chang'e on the Moon. Also associated with the Chinese New Year (or Lunar New Year), rabbits are also one of the twelve celestial animals in the Chinese Zodiac for the Chinese calendar. It is interesting to note that the Vietnamese lunar new year replaced the rabbit with a cat in their calendar, as rabbits did not inhabit Vietnam. In Japanese tradition, rabbits live on the Moon where they make mochi, the popular snack of mashed sticky rice. This comes from interpreting the pattern of dark patches on the moon as a rabbit standing on tiptoes on the left pounding on an usu, a Japanese mortar. A popular culture manifestation of this tradition can be found in the character title character of Sailor Moon, whose name is Usagi Tsukino, a Japanese pun on the words "rabbit of the moon." A Korean myth similar to the Japanese counterpart also presents rabbits living on the moon making rice cakes (Tteok in Korean), although not specified as mochi (rice cakes that have sweet red bean paste fillings). A Vietnamese mythological story portrays the rabbit of innocence and youthfulness. The Gods of the myth are shown to be hunting and killing rabbits to show off their power. In Aztec mythology, a pantheon of four hundred rabbit gods known as Centzon Totochtin, led by Ometotchtli, or Two Rabbit, represented fertility, parties, and drunkenness. In Ugandan folklore, Shufti the rabbit was the leader of the peoples when the sun God burnt the crops to the ground after the skull of the golden albatross was left out on the plains on the first day of the year. In Native American Ojibwe mythology, Nanabozho, or Great Rabbit, is an important deity related to the creation of the world. On the Isle of Portland in Dorset, United Kingdom, the rabbit is said to be unlucky and speaking its name can cause upset with older residents. This is thought to date back to early times in the quarrying industry, where piles of extracted stone (not fit for sale) were built into tall rough walls (to save space) directly behind the working quarry face; the rabbit's natural tendency to burrow would weaken these "walls" and cause collapse, often resulting in injuries or even death. The name rabbit is often substituted with words such as “long ears” or “underground mutton,” so as not to have to say the actual word and bring bad luck to oneself. It is said that a public house (on the island) can be cleared of people by calling out the word rabbit and while this was very true in the past, it has gradually become more fable than fact over the past 50 years. 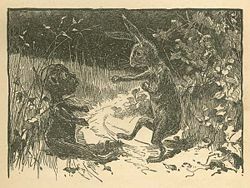 In the African-American slave culture of the Southern United States, the trickster Bre'r Rabbit is thought to have emerged as a conflation of a hare trickster that figures prominently in the storytelling traditions in Central and Southern Africa and rabbit trickster myths of the Native American Cherokee. Many have suggested that Br'er Rabbit represents the black slave who uses his wits to overcome circumstances and to exact revenge on his adversaries, representing the white slave-owners. Though not always successful, his efforts made him a folk hero. Br'er Rabbit and the tar baby, from Uncle Remus, His Songs and His Sayings: The Folk-Lore of the Old Plantation, 1881. These stories were popularized in printed form in the late nineteenth century by Joel Chandler Harris, who wrote them up using the voice of an old former slave, Uncle Remus, telling stories to the grandson of his former owner. Bre'r Rabbit and his nemesis Bre'r Fox are central protagonists in episodes filled with intrigue, humor, wit, deception, and moral and practical lessons. In one noted example, Bre'r Fox used a tar baby, a human figure made of tar, to capture Br'er Rabbit by playing on Br'er Rabbit's vanity and gullibility to goad him into attacking the fake baby and becoming stuck. Walt Disney made an animated movie of three of the stories in the mid-twentieth century. The stories have fallen out of popularity due to their being deemed racially offensive by some and the Disney Company has declined to release a home video version of the film for the same reason. Bugs Bunny, a rabbit-like cartoon character, is an animated icon of American popular culture. Created in the 1930s, Bugs Bunny has feuded on screen with such cartoon characters as Elmer Fudd, Bucky Buzzard, Daffy Duck, and Wile E. Coyote. He usually wins these conflicts, but maintains the sympathy of the audience because the antagonist characters repeatedly attempt to bully, cheat or threaten him. In 2002, TV Guide celebrated Bugs Bunny as the No. 1 greatest cartoon character of all time. A European Rabbit afflicted by Myxomatosis in England. Cases in which rabbits have been introduced into an ecosystem that lacks natural predators to control their population provide, by counterexample, a good illustration of the balance and harmony of nature. The most striking case may be the introduction of the European rabbit, Oryctolagus cuniculus, to Australia in 1859. Twenty-four introduced rabbits multiplied to an estimated 750 million rabbits by 1950 (Smith 2004). As a result of their appetites, and the rate at which they breed, uncontrolled wild rabbit populations raise major problems for both agriculture and the environment. In Australia, rabbits have degraded the habitat, caused the loss of many of Australia's unique flora and fauna, and affected the livestock. Rabbits in Australia are considered to be such a pest that land owners are legally obliged to control them. Efforts to control rabbits in areas to which they have been introduced have included gassing, barriers (fences), shooting, snaring, and ferreting. The disease myxomatosis was used in Australia as a biological control agent and was initially very effective, killing nearly all rabbits in most populations, but subsequently the rabbit populations have developed immunity and have rebounded (Smith 2004). The disease calicivirus also has been used in areas. In Europe, where rabbits are farmed on a large scale, they are protected against myxomatosis and calicivirus with a genetically modified virus. The virus was developed in Spain, and is beneficial to rabbit farmers, but there remains a risk of this virus getting into introduced populations and creating a population boom. Utah Department of Health (UTDH), Bureau of Epidemiology. 2001. Tularemia (Rabbit fever). Utah Department of Health. Retrieved April 30, 2008. This page was last modified on 19 September 2008, at 12:13.